Microsoft's new Surface Pro (2017) Windows tablet packs the power of Intel's new Kaby Lake chip inside, offering a powerful, pricey upgrade to the Surface Pro 4. Set Microsoft’s Surface Pro (2017) next to its predecessor, the Surface Pro 4, and I defy you to tell the difference. With the same dimensions and weight, the two are virtually indistinguishable—a kickstand that reclines further and a few cosmetic changes are all that separate them. What sells the new Surface Pro, though, is on the inside: a dramatic upgrade to the processor and graphics that propels it to the head of the 2-in-1 class. Microsoft built the Surface Pro around a new 7th-generation Kaby Lake processor and its associated Iris Plus integrated graphics, and boy, do they shine. Especially in graphics, the new Surface Pro (2017) almost doubles the performance of the two-year-old Surface Pro 4, and challenges notebooks like the original Surface Book and 15-inch HP Spectre x360, both of which use a dedicated graphics chip. Microsoft demands a hefty premium for that kind of performance, though. (For full specifications and prices of the new Surface Pro, see our separate article.) Not only is the fancy Alcantara-bound Signature Type Cover sold separately ($160), but the more sensitive Surface Pen is as well ($100). Add that to the whopping $2,199 that Microsoft asks for our review model, and you have to ask yourself, do I really want a Surface tablet, or could I save upwards of $700 buying a slightly heavier notebook? Quick—can you tell the Surface Pro 4 from the new Surface Pro (2017)? The new one’s on the left. Because the new Surface Pro is so nearly identical to the Surface Pro 4, most differences are trivial: The front-facing camera now fades into the tablet bezel, for example, and the Surface Pro features a softer, rounded profile. (I only noticed these differences after Microsoft pointed them out, and I bet most users simply won't be aware of them.) The Surface Pro is also the first of Microsoft’s Surface products to ship with the Windows 10 Creators Update. The Signature Type Covers are pleasingly fuzzy, though the fabric tends to compress a bit, especially on the bottom, and collect dust. The color options are nice: platinum, burgundy, and cobalt blue, as well as the standard black. The new $100 Surface Pens ship in the same colors. The specifications should sound familiar. The new Surface Pro measures 11.5 x 7.9 x 0.33 inches, the same as the Surface Pro 4, and weighs between 2.37 and 2.41 pounds. 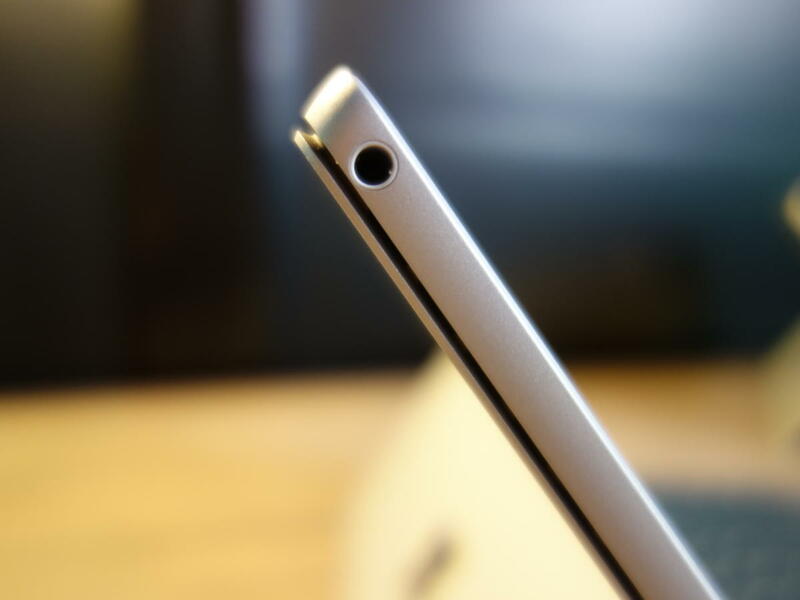 Our calipers found the Surface Pro 4 to be 0.327 inches thin, versus 0.345 inches for the Surface Pro. A cleaner exhaust grille is one of the subtle touches that distinguishes the new Surface Pro (2017). Oh, and there’s a headphone jack, too. As tested, our version—with a 2.5GHz Core i7-7660, 16GB of RAM and 512GB of speedy NVMe storage—weighed 1.74 pounds for the tablet alone, and 2.40 pounds with the Signature Type Cover keyboard. That’s the same weight and dimensions as the Surface Pro 4, already one of the lightest Windows tablets on the market. And don't forget about the integrated Iris Plus Graphics 640 on the Core i7 model (HD Graphics 620 for the Core i5), which adds some real oomph. 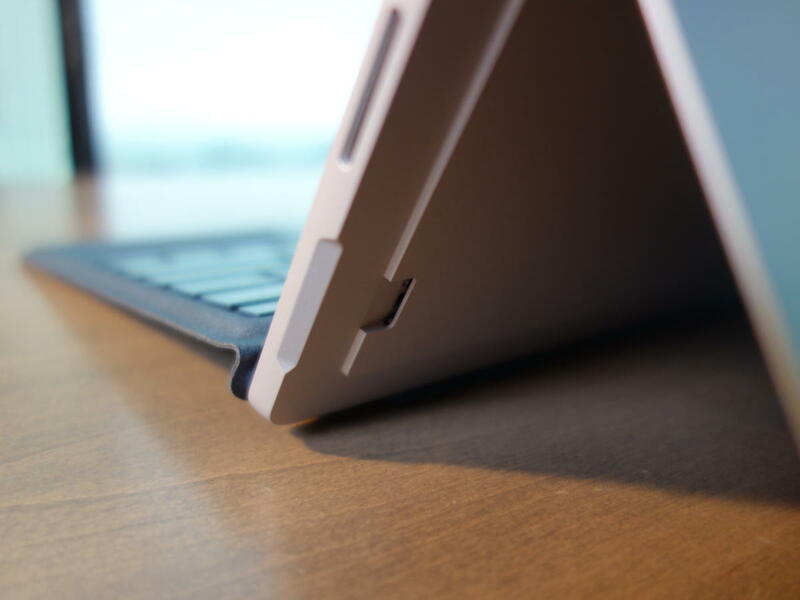 The microSD slot returns to the new Surface Pro, hidden behind the kickstand. Internal differences are slight as well. 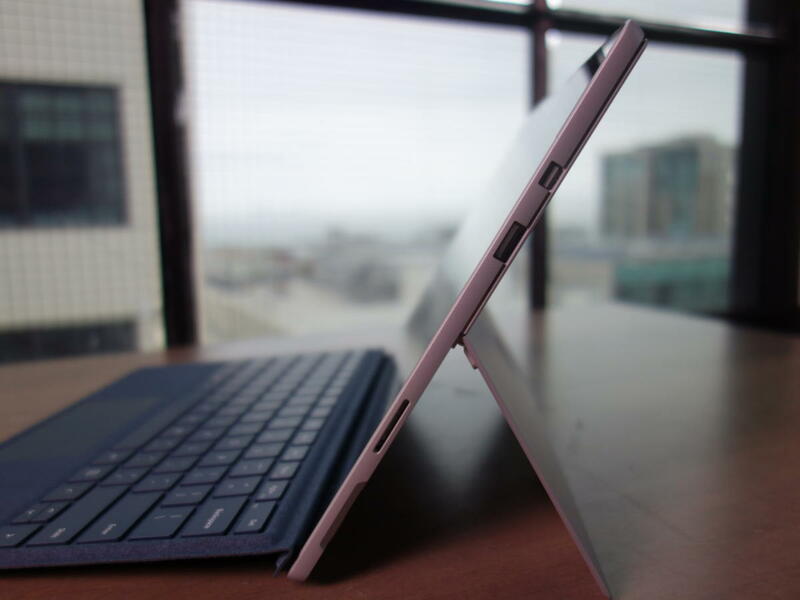 Both tablets contain 802.11ac, along with Bluetooth 4.0 for the SP4 and Bluetooth 4.1 for the new Surface Pro. The benefits of the upgraded Bluetooth will become more apparent once Microsoft releases the planned Surface Pro with LTE variant later this year, as Bluetooth 4.1 signals don’t interfere with LTE. The cameras of both the new Surface Pro and the older Surface Pro 4 appear identical (5MP on the front, 8MP on the rear), and an appropriate resolution for the form factor. The SP4’s rear-facing camera delivered richer color, however, and camera fans should consider the 13MP camera within the Samsung Galaxy Book instead. Most importantly, the Surface Pro’s front-facing camera is Windows Hello-enabled and lightning-quick, thanks in part to a second front-facing sensor that isn’t present on the Surface Pro 4. Fortunately (or not, depending upon your perspective) Microsoft sticks with the traditional Surface I/O complement: the Surface connector, a miniDisplayPort connector, and a full-sized USB-A connector. A microSD card slot hides under the kickstand, as before. 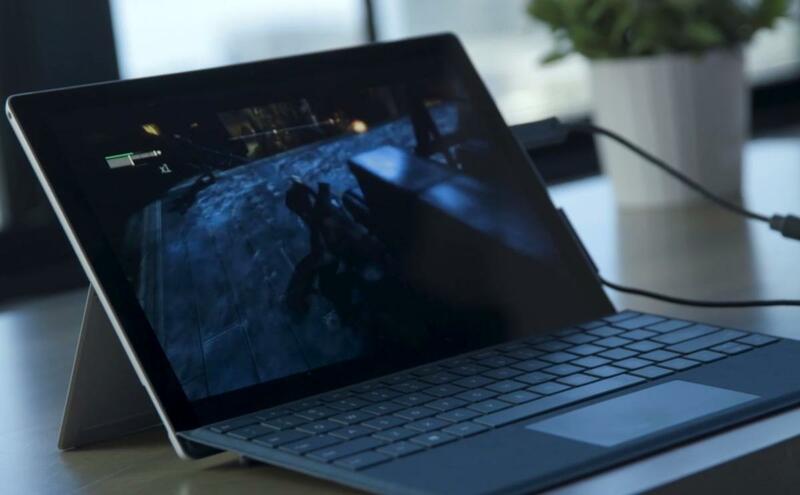 The Surface connector allows Surface owners to attach peripherals that they’ve already owned, like the standalone Surface Dock and charger. I think that’s a smart decision, whereas the Samsung Galaxy Book’s wholesale commitment to USB-C is a mistake. In any event, you know what you’re buying when you purchase a Surface. Externally, the key difference between the two Microsoft tablets is that the new Surface Pro kickstand now folds back to 15 degrees off the horizontal, what Microsoft calls “Studio mode.” This refers to Microsoft’s Surface Studio, the massive all-in-one desktop whose touch display also dramatically reclines to just a slight angle. If you own a Surface Dial, the new Surface Pro also allows you to use the device directly on the screen, something that had previously been reserved just for the Surface Studio. 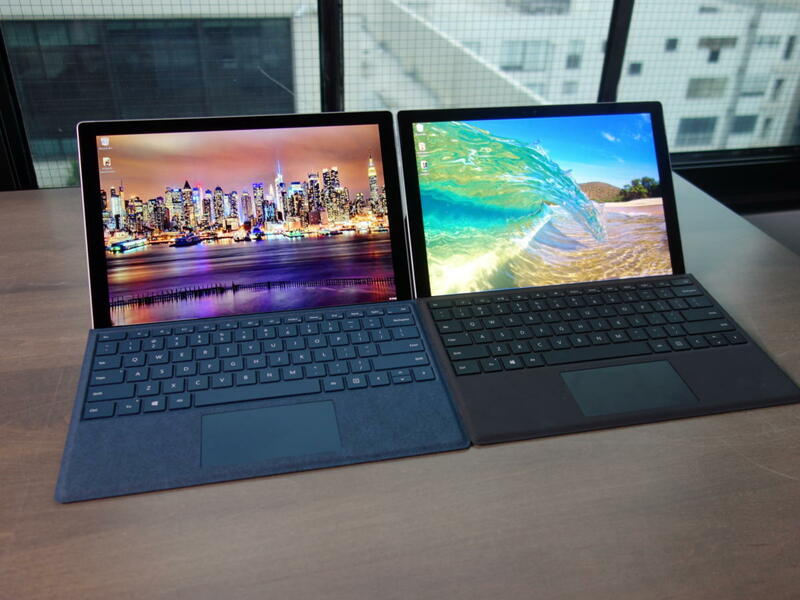 The new Surface Pro (2017) reclines further than the older Surface Pro 4. Fortunately, the hinge is strong enough to take your palm’s weight, though it can sag a bit. 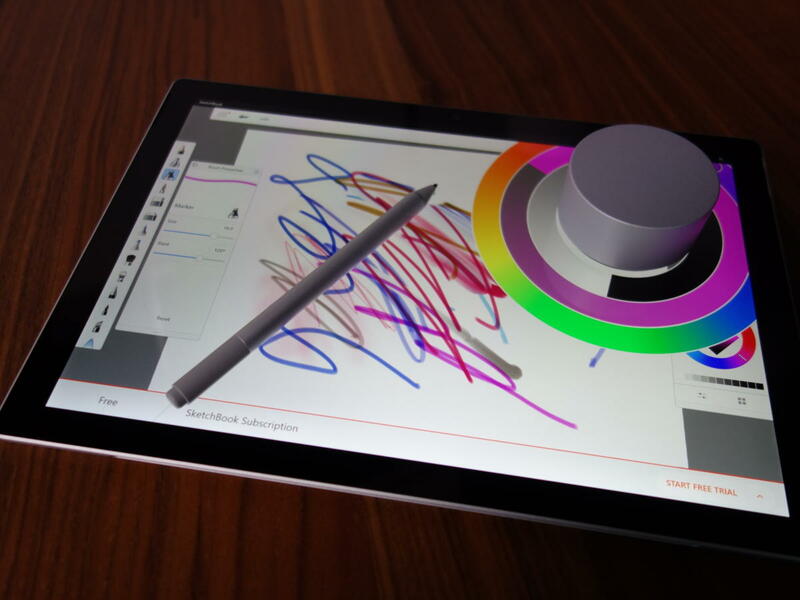 Both the increased keyboard pitch and the Surface Dial integration are designed with inking in mind, either using the existing Surface Pen or the upgraded model. I didn’t notice the Dial slide down the screen as it does on the Studio, though it simply takes up a bit too much real estate to be as useful as it is on Microsoft’s massive all-in-one. Though Microsoft upgraded its Surface Pen to increase the levels of pressure to 4,096, it did so by making the Pen slightly less useful. The new Pen does away with the pen clip. Instead, Microsoft depends on the magnetic strip on the side of the Pen to secure it, which simply proves impractical over time. I still wish there were a pen loop! Otherwise, the upgraded Pen still uses a AAAA battery with a one-year lifespan. 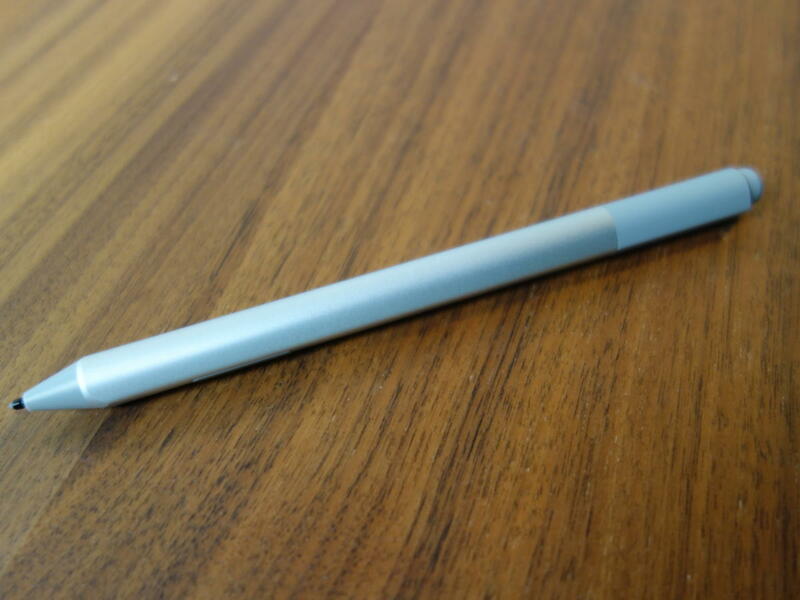 Just as importantly, it retained its ability to “erase” digital ink, a feature not every stylus includes. It inks just as well as the original Pen and comes with “tilt” support as well, generating a broader ink stroke. Microsoft’s new Pen also reduces inking latency to 21 ms. That was impossible for us to confirm, but digital ink flows off the Pen without any noticeable lag—more important as Microsoft makes pen navigation a more integral part of Windows. The new Surface Pen is just as comfortable to hold as the new model. Remember that the upcoming Fall Creators Update includes a “Find My Pen” feature. Other than the fabric, I can’t discern any major difference between the Surface Pro 4’s keyboard and that of the new Surface Pro. (For some reason, however, Microsoft did away with the Insert key.) I preferred the Surface Pro 3 keyboard, and the way in which my fingers simply glided over the keys. But neither the keyboard nor the new Surface Pro’s trackpad hide any flaws, and they’re both efficient and comfortable to type upon for long periods of time. I enjoy the surface Dial, but it feels a little forced upon the Surface Pro. Here’s one of the most impressive features of the new Surface Pro: From a graphics perspective, it offers the performance of the original Surface Book, together with its custom, discrete-GPU base. It vastly outperforms the two-year-old Surface Pro 4—though with a few caveats. 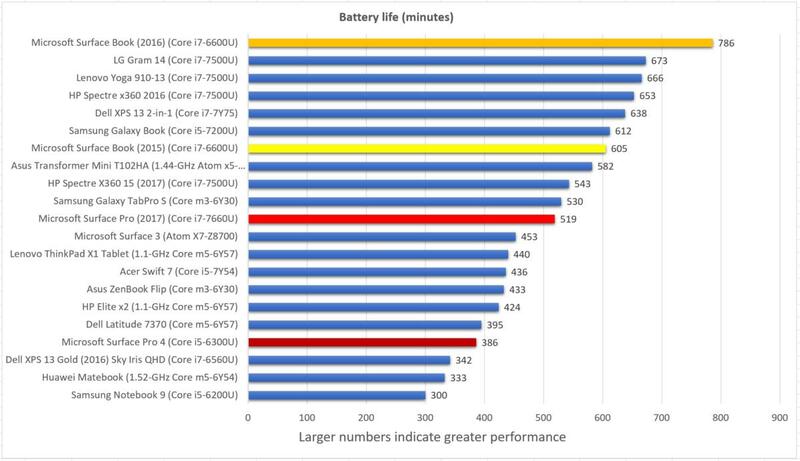 For one thing, our older Surface Pro 4 used a Core i5, rather than a top-of-the-line Core i7. 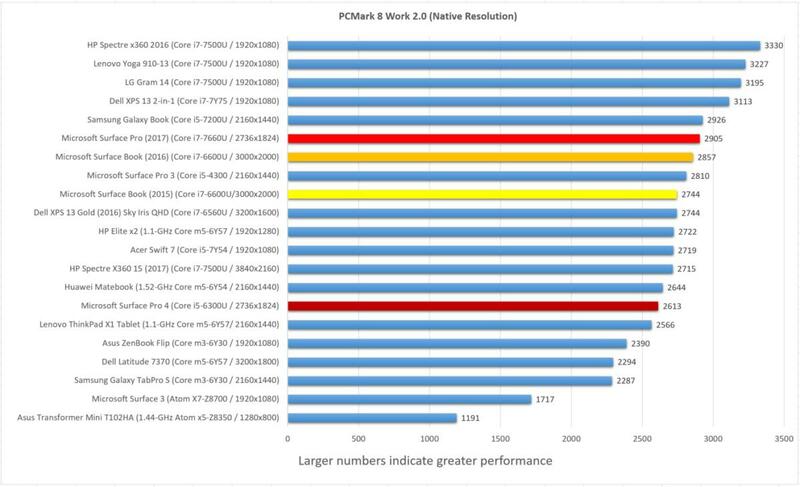 And the performance increases, as impressive as they are, are largely confined to graphics-intensive applications. In the generic PCMark 8 Work benchmark, for example, I noted just a 10 percent improvement over the Surface Pro 4. From a performance standpoint, then, upgrading from the Surface Pro 4 to the Surface Pro makes sense only if you plan to use the Surface Pro for games, image rendering, or similar tasks. Microsoft’s Surface Pro (2017) is powerful enough to smoothly play some older games, like Batman: Arkham City. Still, the Surface Pro isn’t a machine that just checks the boxes, using components with minimal performance in the service of simply filling out a spec sheet. Looking back over our database of tested products, for example, its internal Samsung KUS040202M-B000 NVMe provides among the fastest read speeds we’ve tested: 1,702 MBps, according to the CrystalMark 5.0.3 benchmark. 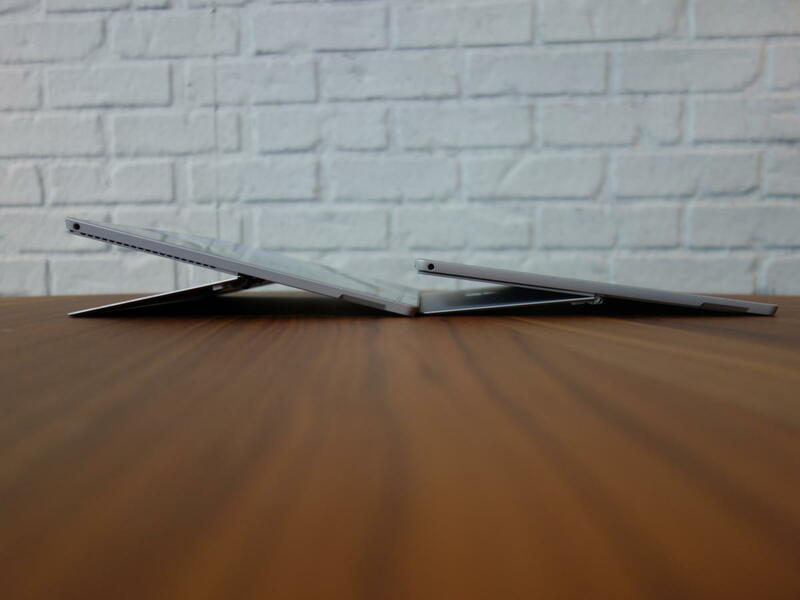 The new Surface Pro’s performance, though, comes at a significant price. According to our testing, the Surface Pro 4 doesn’t suffer any thermal degradation—the tablet runs at the same performance level throughout. While testing the new Surface Pro under prolonged load (such as a looped benchmark or game) its fan turns on and the tablet will clock down, reducing performance in 3DMark, for example, by about 24 percent to over 33 percent. The rear of our tablet, near the top, also gets quite hot. Microsoft told us that it only expected a drop of about 20 percent or so, and advised us that we may have a defective device. We plan to rerun these benchmarks with a new Surface Pro, and we’ll update the review when we do. We always run the PCMark suite of benchmarks, which measure three different workloads: Work, Home, and Creative. Both the Home and Creative workloads include Web browsing and light gaming, while the Creative benchmark throws in media transcoding as well. 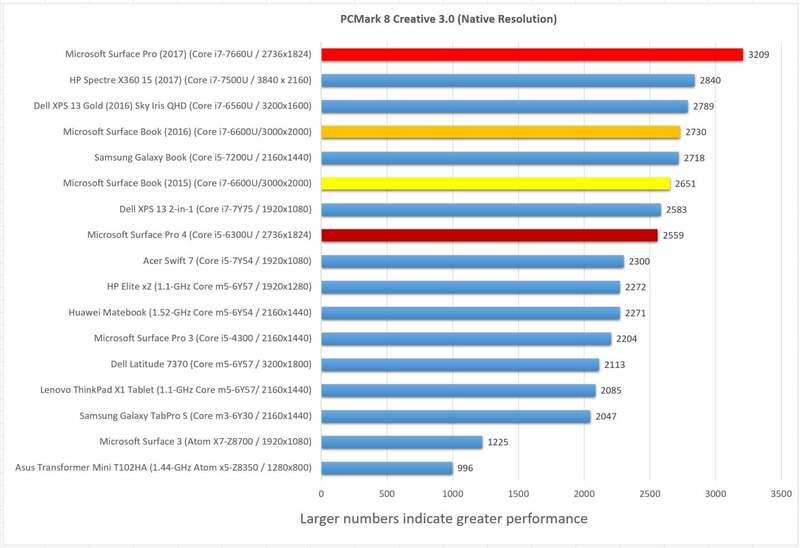 The upshot here is as the workloads become more graphics-intensive, the Surface Pro’s value increases. Though you might expect the Surface Book to top the list of Microsoft products, remember that the Surface Pro 2017 is using a more modern processor. That apparently makes a difference in the Creative benchmark. From there, we move on to measuring more specific tasks. 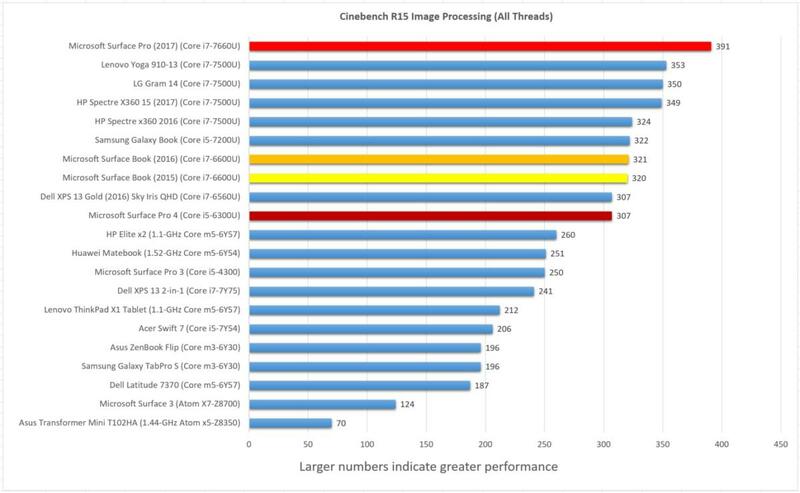 Maxon’s Cinebench measures how well a processor and graphics chip render scenes, and we use it to push the Core i7-7660U’s two cores and four threads to their ultimate. Again, the Surface Pro 2017 performs surprisingly well. You can’t consider the Surface Pro to be a gaming laptop by any stretch, but the Dell Inspiron 15 7000 (not included), a Core i5 notebook with a GTX 1050 Ti GPU, reports a Cinebench score of 478. We also test how the processor fares over time using the Handbrake benchmark, which transcodes a major Hollywood film from a MKV format into something that could be watched on a plane. Again, the Surface Pro is at the top of the heap. 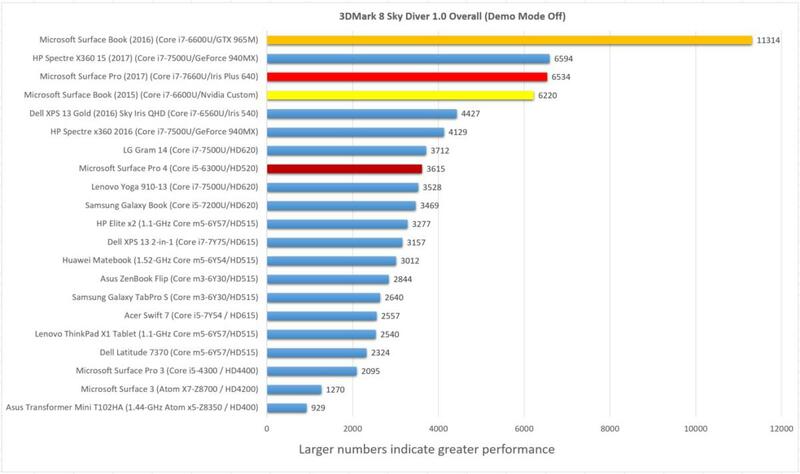 Finally, we tested using 3DMark’s SkyDiver, a traditional benchmark for midrange laptops and some gaming PCs. Microsoft’s choice of the Core i7/Iris Plus combo works great here, though Microsoft’s Surface Book with Performance Base still rules the roost. But look at how the new Surface Pro tablet beats the original Surface Book! Again, though, our results were thermally dependent. 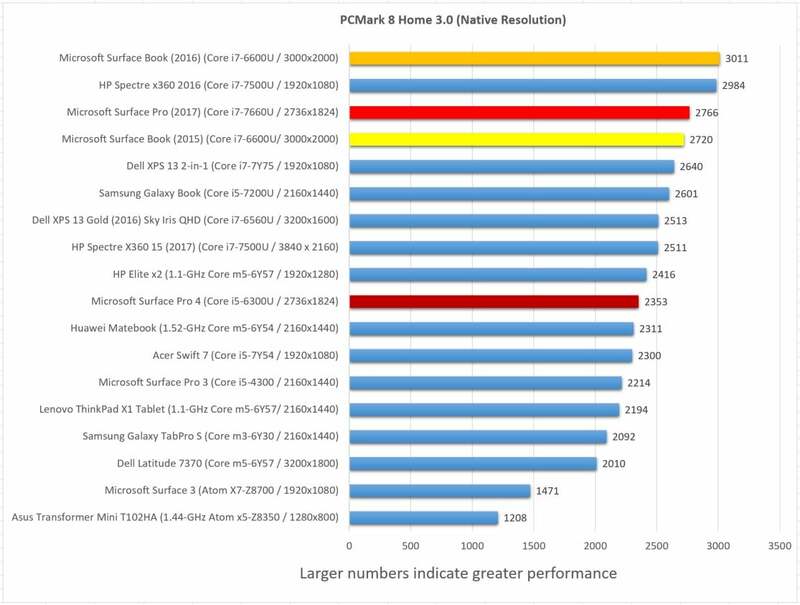 If we stressed the system for a length of time, enough to turn the fan on, the Surface Pro would generate sharply lower 3DMark benchmark scores. It’s worth noting that the Surface Pro 4 does not suffer from thermal throttling, and we checked it again to make sure. 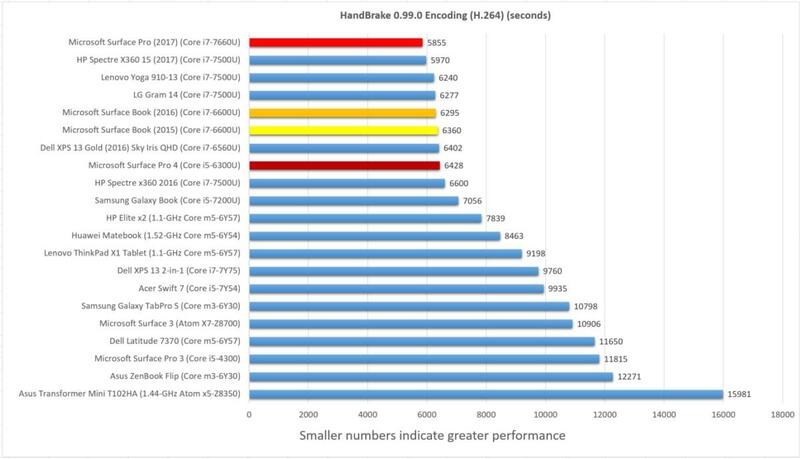 Benchmarks are benchmarks, though. Don’t expect to be able to play the latest Battlefield game at its highest detailed settings. I’m a fan of playing older single-player games on the cheap, though, and games like the original Tomb Raider reboot topped 42 frames per second on 1080p/High settings. Batman: Arkham City also generated 48 fps on 1080p settings, with even better frame rates when you dialed down the resolution a bit. My only concern is how the thermals would hold up over prolonged gameplay.